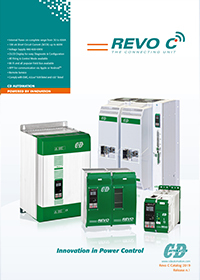 Wherever you are, by choosing the REVO C series, our Service Center can connect to the SCR unit to help you set up correctly with a smartphone, PC or other solutions for PLC remote assistance. • management of the unit through Wi-Fi (as an option) and an APP to be installed on your Smartphone, to get prompt assistance from all over the world by our engineers. Ability to configure the unit and monitor it not only via fieldbus, but also via your smartphone or tablet thanks to the integrated WI-FI.